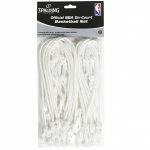 What are Best Basketball Nets Available? Let’s Review Replacement Options! If you ever played basketball you know how important rim net is. At first I never had an idea that net may be that important, but one time I had a situation where we played the game and rim was without one. It was very odd and uncomfortable to shoot the ball. The joy of making the shot was simply not there as there was not that lovely swish sound of accurate jump shot. 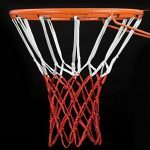 What kind of net to choose for your rim depends on several factors: where your hoop is placed? 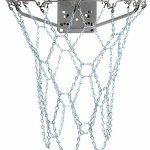 Is it indoor or outdoor, also how rough the game is being played, for streetball I found that chain nets are the best choice, however there are several heavy duty options that will suit well on all weather conditions. 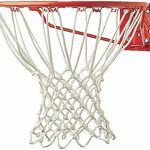 I decided to dig deeper and find out which basketball net is the best and I will lay my findings here in case you need a replacement for your current one. High-end replacement nets have good durability even in outdoor use, they are chemically treated and various other technologies are used to make them last longer in very hot or rainy conditions. 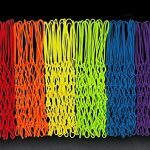 They are made from nylon or polyester material. See my top picks below. 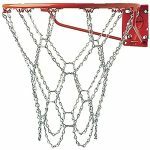 Chain basketball net have way more advantages comparing to nylon ones. Do not think twice if you need an outdoor net. They simply last way longer and zinc plating adds maximum durability. In most cases they outperform any type of nets, from cheap polyester to nylon. 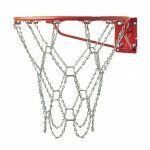 You can attach the chain net to any style rim. So here is the best choices by rating from people who already bought them and use, also these gets my vote too. 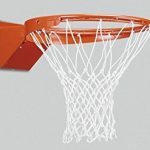 Nylon & Polyester – still the best and most popular rim nets today. These nets offer quality and being used in NBA speaks a lot about quality. They are used on indoor basketball goals most of the time. Simple and cheapest ones are not durable as they tend to shrink and fray, also rooting is becoming a problem if you use them in rainy locations. Companies developed high duty nylon nets now days and these are pretty durable. 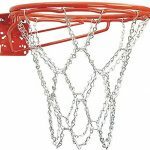 Chain – you are probably familiar with chain basketball net as you can find on most street courts. Metal offers durability and the best option for outdoors. However, the negative side is that they tend to rust. The first thing you should check before getting yourself such net is to make sure that it’s galvanized chain. If you already have one and interested in maintenance, get a water-repellent and spray it to add protection surface to the chain. Also, you can forget about a nice sound of shots, you will hear clink instead of that sweet swish of nylon nets. It’s the number one choice for outdoor and public streetball courts. 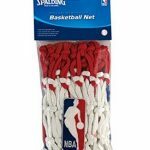 You can get yourself nylon nets that are glowing in the dark, this allows to play at night time and see the rim where to throw the ball clearly. They have fluorescent colors and can shine for up to 7 hours, so it’s really enough to have a nice source of light while you play in dark. The best thing is that by using them you can see the hoop and backboard clearly and of course they look cool. Net lock is a must add-on for public courts as people tend to steal. Various locks are available but basic principle is that they have sleeve that makes it hard to take off the net from rim. This guide will teach you how to make your own net, by doing it yourself you can customize it anyway you want. Take a flat piece of metal and bend it in half, next step is to weld it to the edge. Next thing you need is to take at least 90 millimeter wire, you will need 12 pieces. Cut them to 3 ½ inch long pieces and bend them in half. Next step is to clamp in front of straight pieces of metal rod you made. Bend them over and continue that with every piece of wire until you have your ring fitted over. The final step of building brackets. Space them out along the ring in equal distances. What material you choose is up to you, but I would recommend 7 mm nylon rope. Cut that rope in to 12 pieces of 80 inches each. Next, fold in half the first section of rope and mark the spots that are 8 inches away from folded center. Repeat this process with 15 ½ inch mark, 23 inch, and 30 ½ inch mark. Now you need to tie two ropes at 8 inch marks using overhand knot. Close the loop after forming a loop with ropes. Duplicate this process for other markings on first pieces of rope until the moment you use all of them. Tapering widths are created by doing that. Now you can customize the way you want. The final step is to weave the net onto the rims metal brackets. I also want to show you the video how it’s actually done, he may do some things in a different way, but the principle is the same. Final words of this guide. I would like to say that the most important thing than choosing basketball net is to know in what conditions you will use it. In most of the cases nylon choice is the way to go. 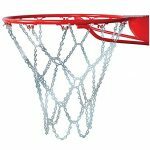 On street courts use chain net, because it offers maximum durability. I hope that this information helps you to make a decision. I believe you will be satisfied with your choice, and of course will bring more joy to the game.